What is the ideal Flow Rate of Turnover through the Sump? Turnover rate through the sump is something that people often overshoot while designing their system. They often end up with a louder pump than needed. It helps to know a bit about how a sump works and how equipment is affected by the turnover rate. This will help you to make the best decision about how much water needs to pass through your system. Many people coming into the hobby do so from the freshwater side of things. Take for example a freshwater cichlid tank with many fish. When you are dealing with a lot of fish and trying to keep the water clean, mechanical filtration does most of the work. Moving a lot of water through the filtration media is better in that case. 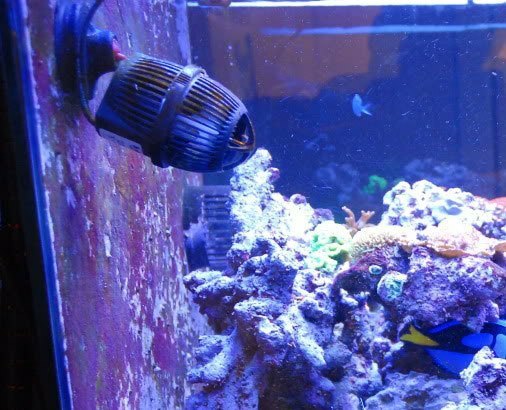 Mechanical filtration is only one part of a typical reef sump, and is sometimes left out completely. Most of the equipment present is not affected by the turnover rate. A sump on a reef tank acts more as a buffer-zone where water can move to a separate area, to be filtered and chemically processed. But it isn’t a matter of dirty water going in and clean water going back up to the tank. In reality, a skimmer or chemical filtration reactor will only process a fraction of the water that passes by it. The majority just moves right on past. So rushing a ton of water through the sump provides no benefit for the skimmer or reactors to work any better. 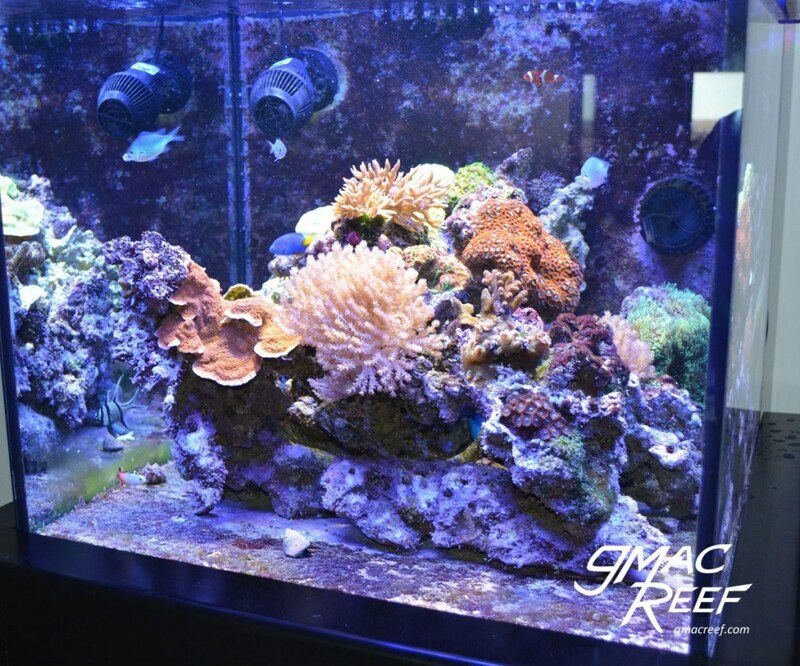 On a reef tank with an overflow and sump, the system needs enough turnover every hour. Provide the system with a mechanism for gas exchange and the removal of solids over the overflow wier. Keep the water in the system a consistent temperature. Create Flow in the tank – a better approach is to let powerheads in the tank create random flow. What is the optimal Turnover Rate? One thing you still hear quite frequently is that you need 10X or more times your system’s volume every hour when choosing a return pump. (An example would be a 90G system = 900GPH). While the 10X rule is a nice round number, a turnover rate of 5X-7X of system volume per hour is often more than enough. The 10X number has been around a long time. It’s hard not to think that most of the people who came up with it were basing it on the equipment that was available a few years ago. Older impeller-style powerheads were much weaker and less efficient than the ones we have today. Many of these newer pumps now have wide flow, and wavemaking capabilities. Using some of these new propeller-style pumps means you don’t have to rely on the return pump to create random flow in the tank. With most of the flow coming from powerheads, you don’t have to do anything fancy with the return line. Doing things like splitting the return outlet between multiple outlets generally isn’t necessary and can actually result in less flow than a single line. Same goes for using loc-line fittings to point the jet inside the tank. All this fiddling and over-plumbing really does is restrict the return pump output. If you are trying to select a pump that is quiet and well suited to the job, just use a single outlet. Large enough pipe will also help to maximize the output of your pump. A smaller return pump can be used, which has a few advantages of it’s own. A smaller pump costs less to buy, and saves money in the long run by using less power. Not a bad idea for a device that runs 100% of the time. There is also a pretty big difference in both heat and noise between a 500GPH pump and a 900GPH one. When adding chemical additives or top-off water to the system, they will enter the display at a slower rate. This ensures changes to water chemistry don’t happen too fast. The theory is this is easier on the livestock. We’ll have to ask them if it makes much difference. What return pump should I choose for my reef tank? The surface tension qualities of water mean that organics in the water are naturally drawn up to the top 1mm or so. This is one reason why it is so beneficial to drain water from an aquarium via an overflow. By allowing the surface to renew, you are helping to add oxygen to the water and remove waste through a natural process. So having a good rate of turnover (more GPH through the return pump) will mean more water goes over the weir of the overflow every hour. So more stuff will make its way to the sump and skimmer. This “stuff” can be dissolved organics and solid particles in the water. But how are you to know what "adequate surface skimming" really means? Well – it depends. This is yet another area of reefkeeping that is up for contention. Most would agree that surface skimming is important, but it is hard to quantify. The difference in results between a coast-to-coast overflow and a conventional one are mostly anecdotal. It would seem that surface renewal is important to an extent, but it’s importance is often overstated. Many overflows can provide decent surface skimming, provided the overflow teeth are designed right. Sometimes this can mean cutting out the existing teeth and replacing them. The bottom line is you will find examples of successful tanks that have all types of overflows imaginable. Most of them can attribute success to good tank husbandry, not what the turnover rate is or how wide the overflow weir might be. The term “flow” is used a lot when talking about reef aquariums, but has a specific meaning on this site. When I say “flow” I am talking about random currents in the display, not the rate of turnover through the sump. Think of a cooking Pot – flow is like stirring up the pot with a spoon, and turnover rate is just adding water while it overflows over the sides. When trying to figure out Flow in a reef tank, especially in an SPS tank, things can get a bit confusing. There is a lot of info out there describing flow patterns, laminar flow, gyres and so on. But you don’t need to understand all those terms. Just think about what you are trying to do: emulate the natural environment of corals. These corals live in shallow water in coastal areas. The waves create pulses, eddies, swells, and what not. Water mixes together in the chaos. Food and waste are always suspended in the water column, ready to be grabbed by coral polyps. If you wanted to create something like that in your tank, you could grab a canoe paddle and start churning up the water. It would be about the same same level of water movement. Of course you wouldn’t do that, but the setup you create in your tank will ideally have a similar result. This is where powerheads and waveboxes come in. Modern propeller-style pumps operate in many patterns and modes of synchronization. This creates random chaotic flow like the ocean. These newer pumps move water in wide currents, so flow is broad and harder to measure by the home hobbyist. It can be difficult to make sense of those numbers when it comes to how much flow that translates to inside of the tank. The manufacturers tend to state their model’s flow ratings in high numbers. As a home hobbyist, you simply can’t test how much water they move like with a conventional return pump. A high number of several hundred gallons an hour gives an idea of power in comparison to other models, but little else. The fact is that this metric is a somewhat unsuitable one for measuring flow. Strong water turbulence and random flow keeps solid particles suspended in the water column. This allows the overflow weir to skim more waste. Good flow also keeps any nutrient solid matter from settling in “dead spot” areas of the tank. If this happens it can begin to break down and negatively affect water chemistry. Your reef tank aquascaping affects flow a lot. A tank with minimal rockwork with a lot of open areas restricts current much less than a tank with piles of rock resting on the glass. It can be a good idea to avoid resting any rockwork on the glass at all because it creates dead spots that tend to trap detritus. The more rockwork you have in the tank, the more powerheads you will need. You can get creative with having open bridge-type structures that aid with flow while hiding the pumps out of sight. A sand bed also dictates how flow moves in a tank. 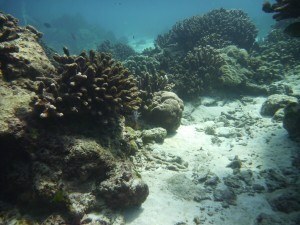 Care should be taken to prevent sand from being blown over the rocks and coral in particular. Corals can get irritated or even die off after only a short time if buried. A powerhead that falls off it’s mount is usually the cause of this, it can also expose the glass in places and look bad. Sugar-fine sand will blow around more than a larger crushed coral variety. You can sometimes add a bit of heavier grain sand on top of problem areas. Although the look isn’t for everyone, many SPS reefers use bare-bottom systems. The main benefit is that there is no sand to blow around. There are less rough surfaces to impede high flow rates, and it is much easier to keep solids in suspension. This aids with feeding corals as well as exporting detritus to the sump. 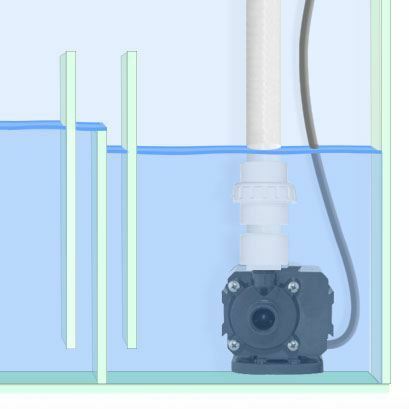 Should the return pump outlets create flow in the tank? Generally speaking, the return line is not a very efficient source of flow. Yet some people will opt to split their return outlets or use spray bars. This is not needed, not to mention it just adds more unsightly equipment inside the tank. Return pumps are designed to lift water up to your display tank against the force of gravity. Using an oversize return pump in an attempt to boost flow usually just results in a noisier tank than necessary. This is one reason why closed-loop systems are so much less common than they were a decade ago. What about Eductors / Penductors? These are nozzle attachments that installed to increase flow coming from an outlet. Both names are often used for the same device. 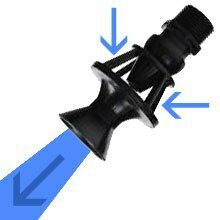 They work by shooting the water through a ring that extends in front of the main nozzle. Surrounding water is drawn through the ring and flow is increased. These were initially invented to help mix large vats of chemicals in industrial applications. They are scientifically proven to mix water flowing out of a high pressure outlet. The only time this can truly be achieved is with a high-flow outlet that pushes around 3000 GPH or more. Still, A 3/4″ model only costs around $25 and can be worth experimenting with on your own tank. Do you need to Split the return outlets? Splitting the return into more than one outlet isn’t generally necessary unless you have a tank over 6′ in length. A good strategy is to just use one return outlet, preferably returning water to the tank away from the overflow. Don’t worry too much about this as long as the nozzle is generally pointing away. Multiple outlets won’t push water as fast and far as a single line. Many people think that they need to have the return line split into multiple outlets. If you do so, realize that by using reducing nozzles you are adding friction to the return, which lowers it’s throughput. If the goal is to maximize the amount of water pushed up from the pump, then you may want to keep the line as a single line. What is the right turnover rate for a reef tank?